The Exorcism of the Syrophoenician woman's daughter, as described in the Gospel of Mark (7:24-30), or the Canaanite woman's daughter as described in the Gospel of Matthew (15:21-28), is one of the miracles of Jesus in the Gospels. According to these particular Gospels, in this miracle Jesus exorcised the daughter of the Canaanite or Phoenician woman in the region of Tyre and Sidon. The Canaanite woman came to Jesus, crying out, "Lord, Son of David, have mercy on me! My daughter is demon-possessed and suffering terribly." 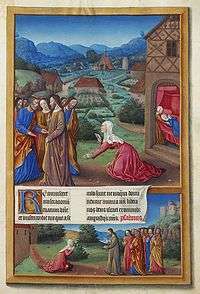 Jesus exorcising the Canaanite Woman's daughter from Très Riches Heures du Duc de Berry, 15th century. He replied, "It is not right to take the children's bread and toss it to the dogs." "Woman, you have great faith! Your request is granted." 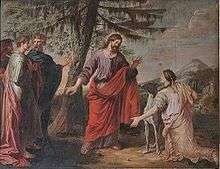 This episode is according to Graham H. Twelftree an example of how Jesus emphasizes the value of faith, as also shown in the Healing the Centurion's servant episode. Burkill, T. A. "The Historical Development of the Story of the Syrophoenician Woman (Mark vii: 24-31). ", Novum Testamentum 9 (1967): 161-177. Downing, F. Gerald. "The Woman from Syrophoenicia, and her Doggedness: Mark 7:24-31 (Matthew 15:21-28)." Women in the Biblical Tradition. Ed. George J. Brooke. Lewiston: The Edwin Mellen Press, 1992. 129-149. Schäfler, Markus, "The Syrophoenician Woman (Mk 7:24-31)"
Alonso, P. 2011. The woman who changed Jesus. Crossing Boundaries in Mk 7,24-30. Biblical tools and studies, 11. Peeters Publishers.